Two billion pounds of new funding to build affordable and social housing in England will be announced by the prime minister later. Housing associations, local authorities and other organisations will be able to bid for the money to spend on projects beginning after 2021. The PM plans to focus on the “stigma” attached to social housing and will say tenants are “not second-rate citizens”. But Labour said the announcement fell “far short” of what was needed. BBC home editor Mark Easton said the government hopes the money will unlock investment into housing schemes that would otherwise appear too risky. 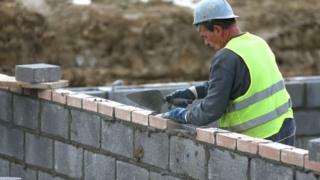 He said the sector’s calls to provide more confidence about future funding – so the 300,000 extra homes required in England each year can be built – had appeared to have been listened to. Downing Street said the funding was separate to the £9bn of public funding put toward the existing affordable homes programme until 2022. Mrs May will tell a National Housing Federation summit in London: “Some residents feel marginalised and overlooked, and are ashamed to share the fact that their home belongs to a housing association or local authority. She will encourage housing associations to change how tenants and society view social housing. “We should never see social housing as something that need simply be ‘good enough’, nor think that the people who live in it should be grateful for their safety net and expect no better,” she will say. David Orr, chief executive of the National Housing Federation, said the prime minister’s announcement was “extremely welcome”. “But the really big news here is the prime minister’s long-term commitment to funding new affordable homes,” he said. He said that by changing the way the funding was allocated, ministers had given “long-term confidence and confirmed that we are trusted partners in solving the housing crisis, building new homes and communities”. But shadow housing secretary John Healey said the reality was spending on new affordable homes had been “slashed” and the number of new social rented homes built last year “fell to the lowest level since records began”. “If Conservative ministers are serious about fixing the housing crisis they should back Labour’s plans to build a million genuinely affordable homes, including the biggest council house-building programme for more than 30 years,” he said. The English housing survey for 2016/17 reported that 3.9 million households – about nine million people – lived in the social rented sector, which was 17% of households in the country. The funding covers the next spending review period, from 2021 through to 2028.